I've been in Kolkata for a week and a half now. On Thursday my brother and I shift home bases to Dehli and a different aunt and uncle, and go to Rajasthan shortly thereafter. The wedding ceremonies were long and confusing for everyone and full of rich food, etc. I'm planning on posting a travelogue later For now know that your Avimaan is alive and well (if driven awake at four A.M. by hordes of mosquitoes). 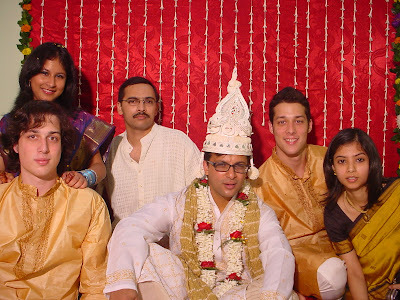 Pictured above is my brother and I with our cousins (from left to right): Runa, Deep, Amit (the beleaguered groom), and Muniya.